Shown with dinghy in folding frame, which MAY be available by separate negotiation. Built Scand Boats of Arendal, Norway, (www.agderboat.no/scand-boat) to a design by Alf Jensen Engines Yanmar 4LH THE 4 cylinder 140HP inboard turbo diesel with single lever control and shaft drive. 798 on original hour meter, 120 on new meter (fitted in 2013 as part of a general refurbishment). 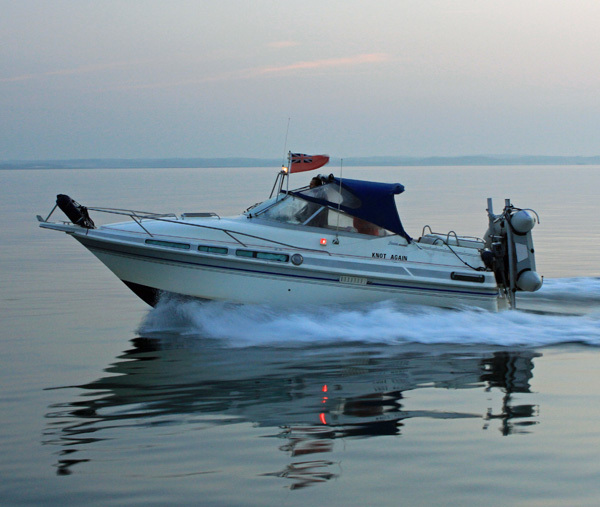 Performance when clean max 21 Knots at 3,300 RPM or 12-15 knots cruise at 2800 rpm. Fuel consumption reported by owner over last 17 years is 13lts per hour average. 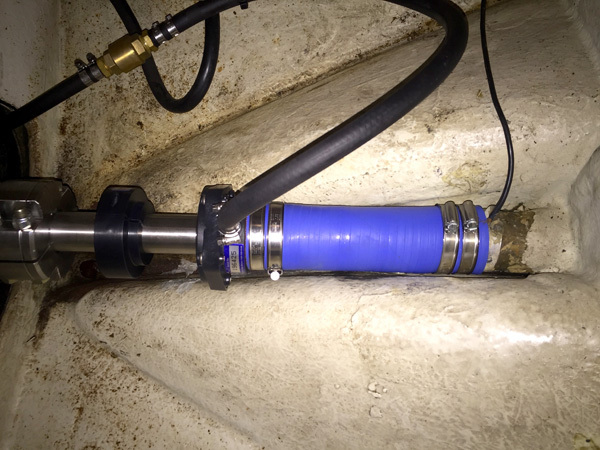 ALL stern shaft gear renewed 2013, new engine coupling, new (2013) shaft gland and tube assembly (see photos). Tanks Fuel tank 34 Gallons, fresh water 23 gallons, holding tank with manual pump-out to sea, and deck pump-out point (capcity unknown but approx 20 gallons), hot water calorifier tank. Berths Twin berths forward with infill, and double berth in aft cabin. But here are a couple to give you an idea! AND now AFTER... great job, all new dash, switching, etc. The whole boat has had a major refurbishment, galley all removed and refurbished, etc. NEW DSC/VHF Novemebr 2017. Note Bow prop. Including mechanicals where required, here new gearbox coupling complete, with new shaft and gland system and tube, etc. 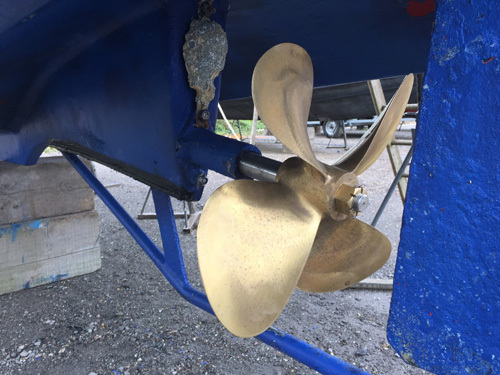 New propeller, and here you can see her skeg keel and solid shaft log, with Kell frame beneath running to the rudder base, offering a good amount of protection to the prop, from grounding but also from lobster pot lines, etc. Sat at her home berth after a full (proper all timber units out job!) refurbishment and new canopy, to boot! Now Very recent photos from Novemebr 2017. Nice fine entry medium Vee hull. Bow platform takes the anchor away from stem, and also allows boarding over the bow, with a walk through pulpit. Note decent length of chain and warp to anchor. Canvas cover over clear foredeck hatch, with grab rails each side. if you need very low air draught or for transport. Side decks have a slight "In Angle" which helps feet stay safe on the way round forward. Here is the frame hinge point. Port side deck, note water and fuel filler points. Aft end, smart inflatable dinghy storage frame, that hinges up and has stand off struts to hold it all solid underway. 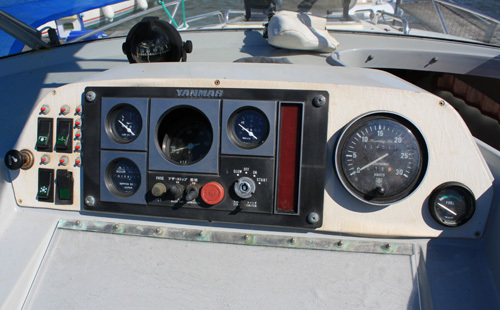 Main helm station wheel on centreline, fold up table to port, and seats turn to face. Cabin entry door to starboard, with recent material cover/hatch. Smart recent canopies, and newly refurbished galley. Full width double berth (head of bed aft) and runs forward under aft end of cockpit. Looking back to door from aft berth, handy lockers whereever possible. Just aft of forward cabin entry door (beautifully varnished) extension VHF speaker, and below, locker to gas. Gas all refitted better than original (spare gas canister included - Butane) and note screen wash bottle and pump left of shot. 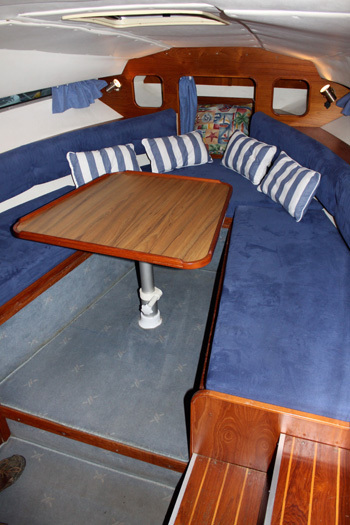 Double berth forward with table dropped and infilled to make a great bed. sensible dinette in fact.. with hard wearing surface. 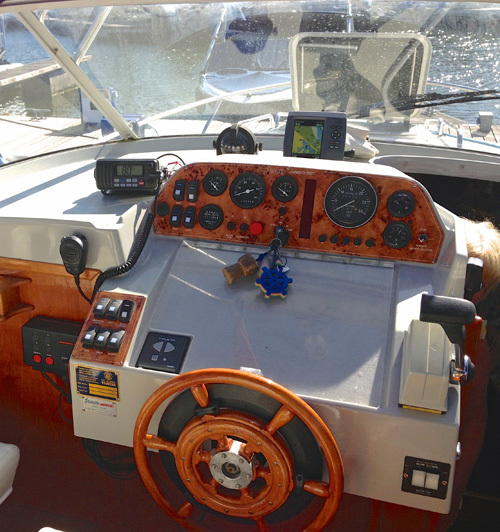 Looking aft to port, VHF on bulkhead (spare working VHF) and toilet cubicle. Simple sea toilet and basin. Cockpit floor gives access to the Yanmar diesel (NEW 2017 fire system). This has to be a rather special example of her type, and I look forward to showing any buyers over her. 4 berths in two cabins comprising: Forward cabin with twin convertible berths and aft cabin with double berth. Separate heads compartment with sea toilet and wash basin. Toilet fitted to discharge direct to holding tank. Galley situated in large centre cockpit with 2 burner gas cooker with grill and refrigerator. Both galley and heads supplied with pressurised hot & cold fresh water (hot water from the calorifier). The accommodation is finished in teak with ample storage and cupboards throughout. Upholstery, mattresses and curtains were replaced in 2013. The owner has produced a nice book/record of the works done and that is available to view. Right through the process, all the new units and timberworks, and new engineering bits, new chargers etc. Electronics 2 x 100 amp batteries, full 240 ring with breakers, 2 x 240 sockets, recent Sterling power 20 amp pro charge Ultra (2013), Suunto magnetic steering compass with night light, VDO Sumlog with various spares, recent Garmin 5" colour GPS plotter, with depth sensor, Nasa Stingray 5600 VHF (spare second VHF) and brand new Icom, ICM411 DSC/VHF linked to GPS unit, voltmeter switchable between batteries, 12v cigarette lighter. Extras Plough anchor in bow locker with 20m chain/rope tail, nav lights, anchor light, full cockpit canopy, swing davits frame for inflatable dinghy (dinghy MAY be available separately), bathing platform with swim ladder, electric auto bilge pump as well as manula pump with two positions, transom pad for auxillary outboard motor, various warps, fenders, line, etc. There have been 4 owners including the current one (we have a paperwork trail that shows details of the owners). They have owned the boat since March 2000. 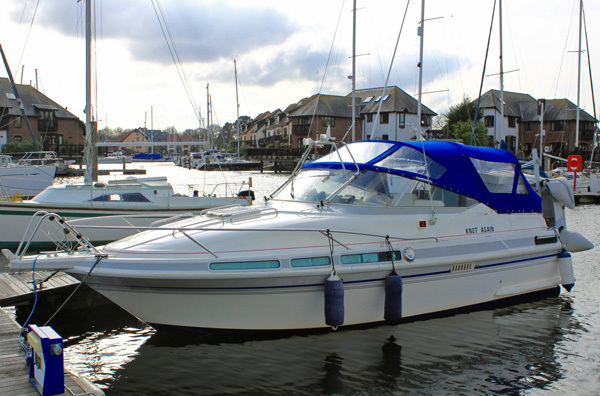 There is no outstanding finance on the boat and good evidence of VAT payment. Broker's Comments The owner has spent a good amount of time, effort and money refurbishing this super little boat to a very high standard and she looks in super order. 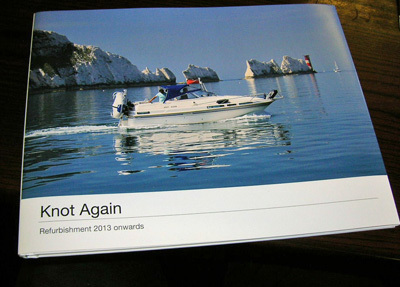 He has put together a smart book showing all the works done, and we have a copy we can show anyone visiting the boat.